Subscribe to receive 4 quarterly paper copies of World Furniture review starting from the next available issue. World Furniture is a quarterly review of economic information and market analysis published by CSIL. 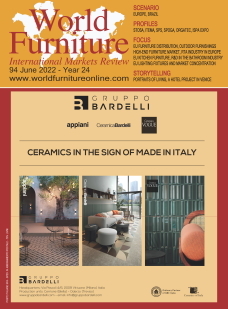 The magazine is issued in English and offers contributions on international furniture and furnishing markets, demand and supply, retail and consumption, business trade, country profiles, competitive systems, international events, fairs and exhibitions. The magazine is now in its 20th year and it's available in print and digital edition. A 'Special Report' and a 'Focus' are included in each issue, offering in-depth analyses of manufacturing segments with their markets of reference, trends and perspectives on the global competitive scenario. Each print issue is mailed to a selected target of 2000 manufacturers and suppliers in the world's main producing, exporting and consuming countries. World Furniture is also circulated at major international fairs in the sectors of reference. 60% Furniture manufacturers (kitchen, office, upholstery, bedroom, dining and living room, bathroom, outdoor). Producers of lighting fixtures, appliances, interior decoration. 30% Suppliers of parts, components, fittings and accessories to the furniture industry. Producers of woodworking machines and industrial automation systems. 10% Trade Associations, Press Offices, Fairs and Exhibitions.